The Bull Draw Fire continues to grow northwest of Nucla. 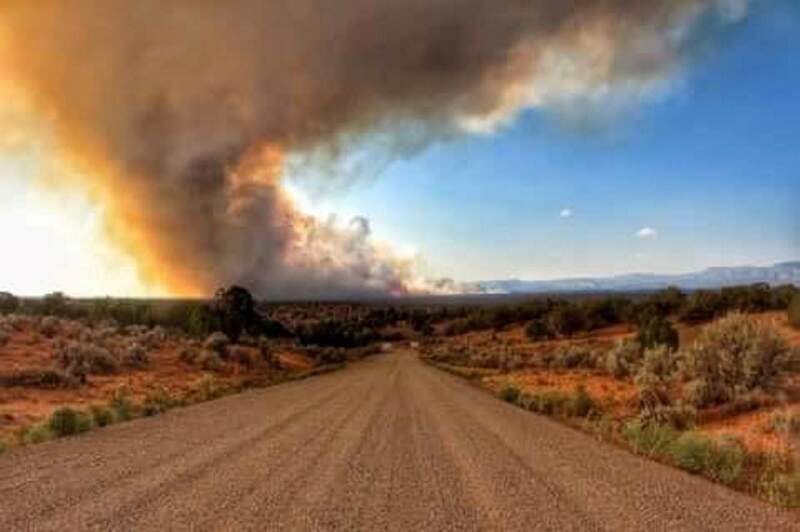 The Bull Draw Fire, burning in a remote area 12 miles northwest of Nucla, grew 800 acres on Wednesday, to a total of 3,815 acres. On Tuesday, the fire grew mostly to the west and south of the fire’s footprint, according to Emily Davis, of the incident command center. Hand crews and bulldozers worked to build a contingency line off U18 Road, using natural land features and an old burn scar. Retardant drops from the air have bolstered work on the ground, Davis said Wednesday. Crews on Wednesday focused on holding and developing contingency fire lines to protect private property. A Type II helicopter worked to fortify lines and address spot fires and tree torching. A Type 3 team took over command of the fire Tuesday morning. About 75 personnel, including three Type 2 hand crews, five engines, two water tenders, three bulldozers and one Type 2 helicopter, were working on the fire, Davis said Tuesday. Additional resources have been ordered, Davis added. The lightning-ignited fire was reported Sunday morning and is primarily burning in pinon, juniper and sagebrush. It grew to 824 acres on Monday. No evacuation orders were in effect, but some roads were closed to public use. They included U-18 road/Spring Creek Truck Trail and Forest Service Roads 668 and 425. Drivers were asked to be careful because fire vehicles and equipment would be moving throughout the area. Smoke from the Buttermilk Fire might also be visible in Delta and Montrose counties. The Buttermilk Fire is burning in pinon/juniper vegetation in the rugged Lime Kiln drainage area 15 miles northeast of Montrose in the Red Canyon area. On Wednesday, it was estimated at 746 acres, and crews focused their efforts on cooling hot spots in Red Canyon and keeping the fire out of the bottom of the drainage, Davis said. Ground support improved contingency lines on the east side of the fire, parallel to Lime Kiln Gulch, and scouted additional line locations. A Type 1 helicopter was assisting in mop-up efforts on hot spots. On Tuesday, three single engine air tankers dropped retardant to help check the fire’s spread across the Lime Kiln drainage, and air support was planned for the evening. The fire had not crossed the drainage, and no structures were immediately threatened, Davis said. Sixty personnel were engaged in the firefight. The fires were impacting air quality in much of the Western Slope. The Colorado Department of Public Health and Environment issued an air quality advisory through 9 a.m. Friday for much of Western Colorado, including Cortez, Dolores, Dove Creek and Mancos. In general, if visibility is less than 5 miles in your neighborhood because of smoke, air quality has reached unhealthy levels, the department said.